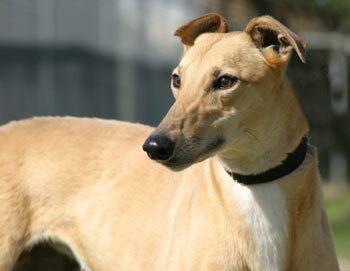 Sheza, aka Sheza Magoo, is a cute, 2½-year-old, fawn female born July 18, 2007. Her sire is Lonesome Cry and her dam is USS Write Up. 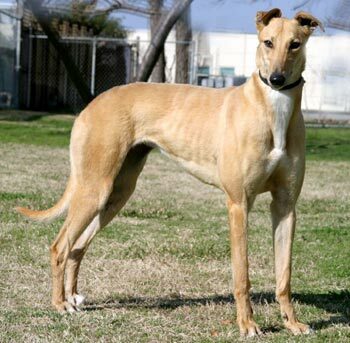 Sheza is the “A” pup in her litter, however she was not individually registered with the NGA. 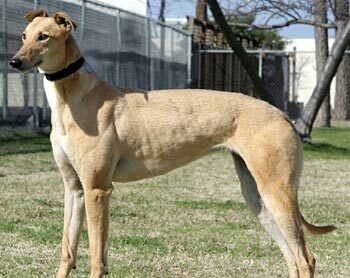 Sheza did not show any promise of a racing career, so here she is – ready to find her forever home! Sheza’s introduction to cats: Sheza cannot be approved as cat trainable. Indoors, she followed the cat along closely, then turned away several times. However, if the cat displayed irritation with her, she got more excited rather than back off. I was able to remove the muzzle, but was never comfortable letting her off the leash in the house. She does fine in the X-pen with the cats roaming the house, unlike some who have more aggressive reactions when they see a cat from the X-pen or crate. There is an understandable response difference to indoor cat vs. outdoor cat, but Sheeza is in serious hunt mode for cat—more so than squirrel—outdoors. Most Greyhounds and other dogs like to shake their toys to some extent, but Sheza is all about the shake. So although Sheza is “not THAT bad” with cats, she should never be trusted with them. We have only fostered this sweet 2-year old girl for a short time, but we have quickly fallen in love with her! Sheza has an infectious smile and the exuberance of a puppy. She enjoys giving us hugs and kisses -- which WE love! -- but we are working with her to ensure that she doesn't go overboard when trying to jump up to show her affection. Our other foster grey-- Rylee -- is much more shy and laid back, so we are crating Sheza when we have to leave the dogs alone. That is working out fine, and Sheza is doing great in her crate. She is a very smart girl and got the hang of house training in no time. Sheza has adapted quite well to our house after spending her first two years in a kennel. She loves to play, is very friendly with everyone she meets, and absolutely loves attention! Sheza has a 2-foot square pink kitty cat pillow she carries with her everywhere. She takes it right out the dog door and throws it all over the back yard. It's quite entertaining to watch! This sweet red fawn girl loves all types of toys, even some of the human ones that are supposed to be off limits. (Our 11-year old daughter has learned to close the door to her room to protect those!) We have a 10-year old Basenji named Kumir, who only weighs about 20 pounds. However, the first day Sheza showed up, Kumir put Sheza in her place and Sheza learned quickly not to mess with the leader of the pack! If you are looking for an incredibly sweet, playful affectionate girl, Sheza is the grey for you!